Sixty years ago , the United States dropped atomic bombs on Hiroshima and Nagasaki, the Soviet Union declared war on Japan, and the Japanese government surrendered to the United States and its allies. 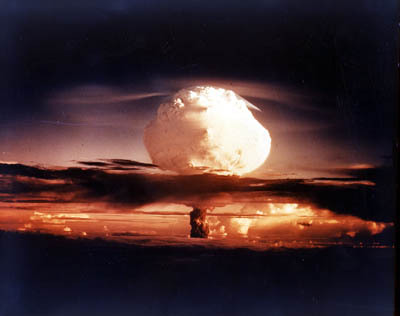 The nuclear age had truly begun with the first military use of atomic weapons. With the material that follows, the National Security Archive publishes the most comprehensive on-line collection to date of declassified U.S. government documents on the atomic bomb and the end of the war in the Pacific. Besides material from the files of the Manhattan Project, this collection includes formerly “Top Secret Ultra” summaries and translations of Japanese diplomatic cable traffic intercepted under the “Magic” program. Moreover, the collection includes for the first time translations from Japanese sources of high level meetings and discussions in Tokyo, including the conferences when Emperor Hirohito authorized the final decision to surrender. ->Were atomic strikes necessary primarily to avert an invasion of Japan in November 1945? 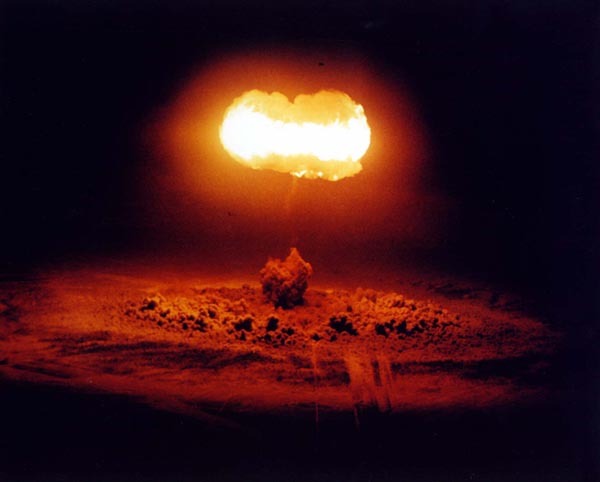 ->Did Truman authorize the use of atomic bombs for diplomatic-political reasons– to intimidate the Soviets–or was his major goal to force Japan to surrender and bring the war to an early end? ->If ending the war quickly was the most important motivation of Truman and his advisers to what extent did they see an “atomic diplomacy” capability as a “bonus”? ->To what extent did subsequent justification for the atomic bomb exaggerate or misuse wartime estimates for U.S. casualties stemming from an invasion of Japan? ->Were there alternatives to the use of the weapons? If there were, what were they and how plausible are they in retrospect? Why were alternatives not pursued? ->How did the U.S. government plan to use the bombs? What concepts did war planners use to select targets? To what extent were senior officials interested in looking at alternatives to urban targets? How familiar was President Truman with the concepts that led target planners to choose major cities as targets? ->Did President Truman make a decision, in a robust sense, to use the bomb or did he inherit a decision that had already been made? ->Were the Japanese ready to surrender before the bombs were dropped? To what extent had Emperor Hirohito prolonged the war unnecessarily by not seizing opportunities for surrender? ->If the United States had been more flexible about the demand for “unconditional surrender” by guaranteeing a constitutional monarchy would Japan have surrendered earlier than it did? ->How greatly did the atomic bombings affect the Japanese decision to surrender? ->Was the bombing of Nagasaki unnecessary? To the extent that the atomic bombing was critically important to the Japanese decision to surrender would it have been enough to destroy one city? ->Would the Soviet declaration of war have been enough to compel Tokyo to admit defeat? ->Was the dropping of the atomic bombs morally justifiable? Here are some glimpses of power of atomic arsenels. This entry was posted in Environment, Warfare. Bookmark the permalink. quite a nice and informative post. i would like to add something to the above. The usual justification provided for the use of atom bombs are that it was used to bring an early end to the second world war and force japan to the negotiating table. But this was just one of the reasons according to me. America was always doubtful about USSR and its policies. So the dropping of atomic bomb served two purposes:- a show of strength for the enemies and force the end of war. Secondly, eventhough the weapons had been made, the exact strength of the weapon was still untested. The aiforce was instructed to visually attack the target rather than radar attack so that photographs of the damage could be taken. 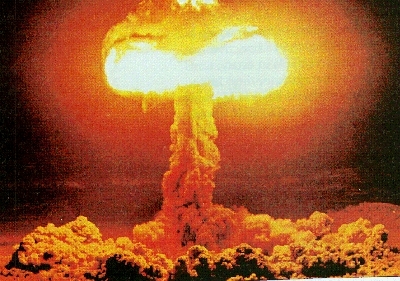 The primary target of Hiroshima and Kokuro, and the secondary target of Nagasaki were mainly excluded from the night air raids for this very reason. One (Enola Gay) carried the actual bomb, the second one (Great Artiste) carried instrumentation and the third one (previously unnamed,later called “The Necessary Evil”) carried the photography equipments. The second attack on Nagasaki could have been avoided. Japan, thinking the Soviet Union was a friendly neutral in the war in the Pacific, submitted unofficial peace feelers to the United States through them. The Soviet Union, secretly wanting to join the war against Japan, suppressed the feelers. Ironically, the Japanese military made it impossible to pursue peace directly, as they arrested or killed anybody who tried to extend official peace offerings. As it was, these unofficial feelers were completely unacceptable to the U.S. as they merely made vague offering to return conquered territories in exchange for peace. So you see it was a combination of many factors that led to the bombings and many people loosing their lives. 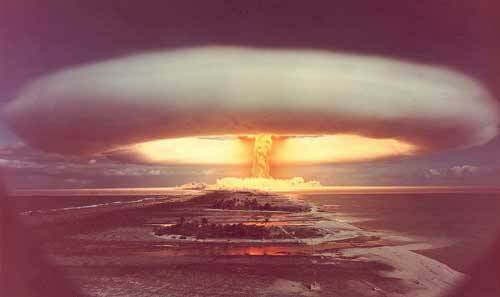 Since WWII, weren’t the nuclear bombs more powerful 10x? Why you feel like that? Why you are willing to use this on your neighbour? I think you are joking but I dont think its a good joke dont you see the body of different people being victom of atomic bombs? Why we make bombs? for destroying humanbeings? Why we dont feel the pain of people being victom of bombs and other blasts. Why we make people criplled?Why we destroy there whole life? Why we feel happy when we give pain to other people? Why dont we use our sense that the victoms are just like ourselves? Why we love to give pain? Why we dont realise that we are here for small period and go back to our Allah. Why we became stourght hearted. please wakeup the humanbeing in yourself and say good bye to animal like thinkings. Aaah but animals are much better then our selves the dont make atomic bombs,splinter knails under nails, slaughter others. Please please every one who is reading this message, love humanbeings because we are made for loving please dont abuse humanity please! To think that a human beeing is the most distructive creature on earth, and not realising that they are even destroying their own habitat…. oh, so stupit !!! mankinds inability to contain its own nature has led to this scenario,so the kill or be killed nuclear age has evolved,we only live in relative peace because we are collectively assured of mutual destruction.when logic can compute emotion,then,and only then may these “necassary evils”be dismantled.history is rich with human folly,individually we can see the futillity of war,but collectively,we have to fight.only when the metaphorical thorn is removed,will true peace reign.god is that the time?must go. Yea I cant wait to the war breaks out in da streets of america and we have to fight off terrorists and other threats to the states, Only then can I truly beable to determin if i am worthy of streinth. It would be fun…. but then again no it wouldnt, We do still have to keep our good deeds intact if we sure to survive. this is a v.brutal way of wiping out the entire Japs in those 2 cities. where did dialogue go2 as at the time of the war,afterall it is said that Dialogue IS THE BEST FORM OF CONFLICT RESOLUTION. At Least they didin’t trow a Neutron Bomb! Wasn’t there a third atomic bomb ? what happened to it ?